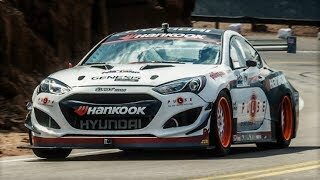 The 2012 Formula Drift has recently kicked off and the highlight of the event is without shadow of a doubt the Hyundai RMR Genesis Coupe 2013. Based on the Genesis Coupe the RMR is both a powerful and good looking drifting beast that manages to steal the show hands down. Let's take a look at some of the Hyundai RMR Genesis Coupe 2013 characteristics, and why not, compare it with the base street model. The base model comes with two engine variants, a 2.0 liter turbo engine developing 274 horsepower and 275 lb-ft of torque, paired up with a six-speed manual transmission as standard. The second option is a 3.8 liter Lambda V6 unit producing 348 horsepower and 295 lb-ft of torque. The 3.8 liter V6 version is able to accelerate from 0 to 60 in just five seconds and has an electronically-limited top speed of 149 miles per hour. Now comes the fun part. 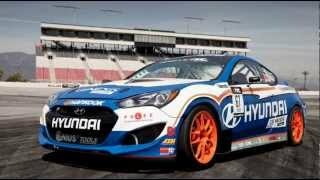 The Hyundai RMR Genesis Coupe 2013 develops more than 600 horsepower and has been tuned-up extensively for drifting. The engine uses direct injection and twin-scroll turbocharger technology, and obviously sends all the power to the back wheels in order for the Hyundai to achieve extreme drift angles. Furthermore the powertrain has been replaced, the body is more aerodynamic and obviously the interior of the car has been modified by adding a roll cage, a driver bucket seat and loads of racing instruments in order for the Hyundai RMR Genesis Coupe 2013 to meet the racing standards. In case you wish to see the Hyundai RMR Genesis Coupe 2013 in action you'll be happy to learn that you might still have a chance to do so, and if you're going to be impressed by what the drift-tuned Hyundai RMR Genesis Coupe 2013 keep in mind that you're able to have at least a feel of what it's like to drive the RMR by buying the street version of the Genesis Coupe. Check the full 2012 Formula Drift Schedule below.